A centenary tribute to one of the most celebrated conductors of the 20th C. His life and work, centered on a concert register accompanied by reviews, comments, and a series of short appraisals of his own compositions. As far as I am aware, the format for this book is unique. For the main body, the author has compiled a complete concert register for the conductor, Antal Dorati – no mean feat when you consider that he was one of the most widely travelled as well as one of the most frequently recorded of musicians. The book is the result of years of painstaking research, which included a visit by the author to Switzerland in 2003 to meet Dorati’s widow - the pianist Ilse von Alpenheim - accompanied by the record producer Bill Newman, himself another Dorati fanatic. Richard Chlupaty’s devotion to this conductor is total. In addition to producing the book, he has created an "archive" of materials – recordings, dvds, reviews and concert programmes. He has also been responsible for setting up the Antal Dorati Centenary Society. (www dorati-society.org.uk). The concert register occupies the central core of the book, about 360 out of 445 pages. To avoid monotony the register is divided into chapters, each with a short introduction by the author, which correspond broadly with the periods of time spent with each of the many orchestras directed by the conductor. Are there any revelations? As you might expect, there is a fair smattering of contemporary music with Bartók featuring prominently. Loads of Brahms symphonies too. However it came as quite a surprise to me to learn that Dorati performed Mahler’s symphonies and song cycles so frequently throughout his career, in particular during the early part, when Mahler really was a concert rarity: No. 4 in Dallas in 1949, Nos. 1, 2 and 3 plus Kindertotenlieder and Das Lied von der Erde in Minneapolis (1950-54). He did Mahler 7 with the Israel PO in 1961 and No. 10 in Tel Aviv and Stockholm. His only commercial Mahler recording was of No. 5, also in Stockholm. An even greater shock for me at least was to see performances of so many of Bruckner’s symphonies, including several of the Ninth, an experience so weird I cannot even begin to imagine it! He was clearly a man of great energy. I note that during one ten week period in the spring of 1962 he conducted no fewer than ten orchestras from six different countries. Definitely a chapter to dip into rather than attempt to digest in one go. There is much to enjoy elsewhere. Some may well quibble about the choice of outstanding recordings, including the Brahms symphonies (LSO/Min SO), Prokofiev 5 (Min SO) and the Tchaikovsky 6 (LSO). I certainly would. It is always a pleasure to read Bill Newman’s first-hand observations – often humorous, occasionally hair-raising(!) - of this colourful conductor, both in the concert hall and the recording studio. I found the section on Dorati’s compositions of particular interest, illuminated by comments from Heinz Holliger, Janos Starker, Calum MacDonald and other admirers. Several of Dorati’s scores continue to be available in print as do some CDs, including the two symphonies, promoted mostly by the Swedish BIS label. 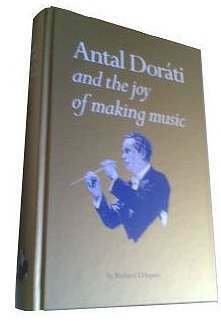 The book is also tastefully illustrated with many photographs of Dorati as well as reproductions of some of his LP sleeves and concert programmes. So to the key question: is the book likely to be of interest to anyone other than Dorati fanatics? While paying tribute to Richard Chlupaty’s dedication and thoroughness, I fear the answer is "unlikely". A project such as this inevitably offers a one-sided view of this fascinating, yet complex musician. All of the selected reviews which accompany the register are positive ones, despite the fact that Dorati’s conducting skills have not been universally admired. His high voltage style, coupled with what some view as rhythmic rigidity, led one critic to refer to his conducting as "metronomic" and another as "businesslike". Dorati’s own comments on this particular point are refreshingly candid in his very entertaining and well-written autobiography, "Notes of Seven Decades": currently out of print, but copies widely available via the internet/public libraries. Dorati was clearly a significant musical figure who made his mark in several ways: as composer, arranger, orchestral trainer and a principal conductor who always encouraged performances of contemporary music. While undertaking this review I came to the conclusion that there is yet another book waiting to be written to provide a more balanced appraisal of the contribution made by this remarkable man to the 20th Century musical scene. I suppose the same case could be made for other high ranked conductors from Dorati’s native Hungary: Reiner, Szell, Solti, Ormandy and others. Now that would be quite a book. Is there anyone out there who might be interested? www dorati-society.org.uk Antal Dorati Centenary Society.